On November 16th, 2018 about 120 students and residents of from Bayard attended an Open House at the Bayard Public Library. The Open House promoted the library’s new Homework Hotspot. The Bayard Public Schools and Library have established a technology focused partnership to provide school district students and staff access to the school’s internet at the library. The new Homework Hotspot will feature internet speeds up to 200 Mbps, which is a dramatic increase from the libraries current internet speed of 15 Mbps. Gov. 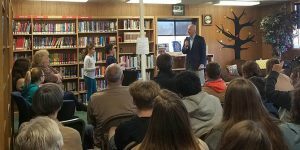 Pete Ricketts answers questions from Bayard Public School students. Gov. Pete Ricketts attended the event and addressed the critical need to provide high-speed internet for all residents in rural communities. About 15% (45,000) of Nebraska’s public K-12 students have no internet at home, or internet so slow or unreliable that they are not able to carry on digital learning activities. Many of these students go home with a school district-owned device, such as Chromebooks, which require a constant internet connection. The new Homework Hotspot at the Bayard Public Library will help address this “Homework Gap”. Now, Bayard school district students can bring their school issued devices or use one of the two desktop computers that are connected to the fixed-wireless Wi-Fi connection between the school and the library to work on homework and school projects. This entry was posted in Public Relations, Technology. Bookmark the permalink. ← Library people: get the upper hand on your tech! The free Toward Gigabit Libraries toolkit is out and ready to help you!